Infographic: Top 100 Life Coach Blogs 2013 - We're Number 3! The annual Best Coaching Blogs Contest is starting up again this month and the entry period is now open. Every year, since 2009, School of Coaching Mastery has sponsored this online contest between many of the top blogs in business and life coaching. Thousands of readers check out the blogs entered and the coaching bloggers, themselves, report that it's fun, attracts new readers to their blogs, as well as new coaching clients. Best Coaching Blogs Contests in past years, have always thrived on social sharing and cooperation, as much as on competition. This year, we've revamped the contest to make it even more social than ever and we're putting it in the format of a blog, which kind of makes sense! We've also gotten rid of the dreaded 'Down Vote' option, which caused a fair amount of consternation in years past and we're experimenting with allowing people to vote as often as they wish. This year, when you enter your coaching blog, your entry will show up as a blog post on the contest page. Each entry/blog post will have social sharing buttons at the top of it, like the ones you see above this post. The social sharing buttons will function as votes, which will display the total number of shares/votes for that entry. 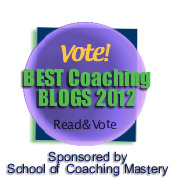 The 20 bloggers with the most votes will themselves vote via closed ballot for the Top Ten Best Coaching Blogs of 2012. Winners will receive permanent listings on this site, with links to their blogs, plus winner badges and bragging rights. In past years, major coaching organizations have entered, as well as coaching students with brand-new blogs. The winners every year are a mix of established blogs and newbies, meaning anybody can win this prestigious blogging contest. If you make it to the semi-finals, vote for the Best Coaching Blogs of 2012, based on the quality of their content and good sportsmanship. Do you have a Coaching Blog that you'd like to enter in Best Coaching Blogs 2012? Have you ever wished you could get insider tips on how to succeed at something? Like how to win a contest or how to attract more clients? Well, I'm about to give you insider tips for both. Marketing experts say that blogging is one of the most important tools for client attraction in any type of business, particularly if you don't have a big advertising budget. That advice couldn't be more true for coaches. That's why we sponsor the Best Coaching Blogs Contest each year. Coaching Blogs offer some of the most cutting-edge information about coaching and they are free. That's awesome for the consumer and it's a great marketing strategy for coaches. The contest highlights the very best and it's an effective inbound marketing strategy for School of Coaching Mastery. Everybody wins. But not everybody wins the contest. Winning at Best Coaching Blogs is a lot like winning at blogging. Both will attract more clients to you, so listen up! 1. Know your audience. The easiest audience to write for is yourself, your friends, or your clients, in that order. But if you're writing to attract more clients, you need to work harder to offer value, to be understood, to create fans and attract clients. If you're writing to win Best Coaching Blogs, remember that your blog will be read by folks who don't know you and you'll need to win over both coaches and non-coaches. They are very different audiences. 2. Know the difference between a business blog and a personal blog. A personal blog, or weblog, can be quirky, weird and profane. 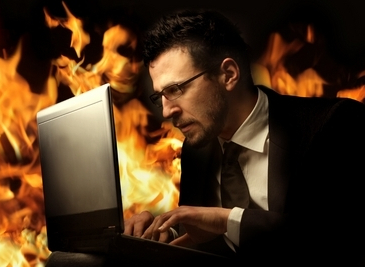 A business blog can be all of that, too, depending upon your audience. Generally speaking, a business blog needs to offer more service and value and build more trust than a personal blog, because you ultimately want your readers to spend not just their time, but their money with you. That usually requires more discipline and perhaps less soul-baring. Service, value, trust and discipline will go a long way to help you win the Best Coaching Blogs Contest. 3. Actively create trust. Notice that the word, 'trust' is coming up a lot? You may have already created a fantastic level of trust with the folks who know you, but if you want to attract more people (and contest votes) via your blog, you'll have to create trust through your actual writing. How do you do that? Tell the truth. Give away your best secrets. And show up consistently, meaning develop a consistent voice and blog regularly and frequently enough that people start to count on your articles. As a rule of thumb, you need a minimum of about 20 articles to create blog credibility and you should be blogging once per week or more. 4. Titles are critical. Learn to write titles that engage quickly and pique curiosity. You only have a second or two to convince someone that it'll be worthwhile to spend their valuable time reading your article. Check the right-hand column of this blog for a list of our ten most popular blog posts and you'll see examples of many of the types of posts that engage and create curiosity. If people don't read your articles, you won't attract either clients or votes. 5. Make sure the article delivers what the title promises. Piquing someone's curiosity and then immediately pulling a switcheroo to get them to buy or download something is just plain rude. It's also marketing suicide and readers will mentally blacklist you in a heartbeat. Don't use your blog to sell. Also, don't use it just to write about a product or program, unless your audience tells you they love that. Do offer something of value at the bottom of your posts for people who may want more. Treat your readers with respect and they'll come back. They may even vote for your blog. 6. Be remarkable. Thousands of life coaches write about the Law of Attraction. Don't be one of them unless you have something different to say. Write what no one else writes. Empower your readers. Help them achieve their goals. Make them feel smart for discovering you and they will tell all their friends. And their friends will tell friends. Soon, you have raving fans for your blog and for your work. Fans vote with a vengence. 7. Be Social. Success in the blogosphere is achieved through cooperation, not competition. Read other blogs and comment on them. Link to the best ones. Guest post on some. And announce what you and other bloggers are up to throughout the social media web. This advice is especially important during the contest. Treat your fellow contestants like friends instead of enemies, because in the end, the semi-finalists choose the Top Ten Winners. 8. Play nice. Every year, at least one blogger succumbs to the temptation to cheat and it's the other contestants who notice it first. That's a dumb strategy, because the contestants are the ones who choose the winners. Either play nice or loose. 9. Break the rules. Although I'm giving you awesome advice for writing a successful blog that wins like crazy, your audience may want something completely different. Pay attention to them first and foremost and watch your blog grow in popularity. Best Coaching Blogs is in many ways a popularity contest. Write for your readers (and voters) and win! Go here for a related article called, Best Coaching Blogs: Why a Winning Strategy Might Not Win. Are you a blogger or even winner in one of the Best Coaching Blogs contests? What strategies do you use that I've left out here? Please share your best blogging strategies in the comments below. Want more ideas? 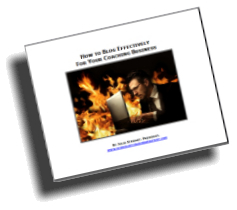 Download the free How to Blog Effectively for Your Coaching Business ebook here. 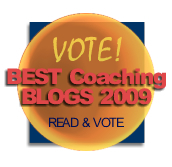 Best Coaching Blogs 2010 opens this morning. Enter your blog to win! 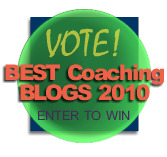 The Best Coaching Blogs 2010 contest 'officially' opens this morning. A few of last year's participants entered over the weekend, so you can begin voting right away. However, we will still be in the 'entry period' until the end of May, adding new blogs as they are entered. Right now is the time to enter the coaching blog contest. How does the Best Coaching Blogs contest work? Any self-described coach who blogs on coaching themes may enter for free. You'll get a badge, similar to the one above, to post on your blog, website, and social profiles, with a link to the contest, so your readers, clients, followers, etc., can all vote for you. Only one vote per blog entry, per IP (computer) address. And of course, you'll want to blog about it and post about it on social sites. Last year, major coaching organizations, professional coaches and even student coaches all entered - and won! How are Best Coaching Blogs winners chosen? Initial votes are cast by the public, so be sure to mobilize yours. Final results will be determined by the Semi-Finalists, themselves, in a closed vote (online survey). Criteria for winning include the quality of blog content and good sportsmanship. A summary of the final vote counts will be made public in a downloadable PDF document. The contest winners will be announced in this blog on July 1st. What do the Best Coaching Blogs win? Every blog that makes it past the initial entry period will get a badge that describes what level they won (1st Place!) to display on their site, plus bragging rights. And this year, we're adding prizes - winners will receive free memberships to Coaching Insiders. More on that later. Why should you enter Best Coaching Blogs 2010? Well, you just might win. Last year, 50 blogs entered. New coaches, as well veterans, competed and won. There were 30,000 hits to the contest page within 2 months and visitors continue to visit the list of last year's winners, which links to their blogs. Winners also got picked up by other online lists of best blogs. Perhaps the real reason to enter is that you'll get new readers and perhaps new subscribers and clients. That's what last year's participants told me. They also told me the whole thing was a lot of fun! Last, the Best Coaching Blogs contests are designed to spotlight great coaching and how it helps others do great things and have better lives and more successful businesses. Coaching is changing the world. Please share this post with as many people as you know, especially coaches. Our social share buttons at the top of this post make that easy for you. And if you decide to enter, good luck! Enter Best Coaching Blogs Here. Last year's Best Coaching Blogs 2009 was hugely popular. Over 30,000 visitors read and voted on their favorite blogs and the winners, from all over the world, ranged from big coaching organizations to new coaching students. We're getting ready to do it again. After reviewing a variety of approaches to help us upgrade security and fairness, we realized we already have eveything we need to run another great contest. Who can enter Best Coaching Blogs 2010? Any self-described coach who already has a blog. Please don't enter if you aren't at least a coaching student and obviously don't enter this year if you don't already have a blog. What's the benefit of entering Best Coaching Blogs 2010? Hundreds, if not thousands of new readers, potentially getting picked up by lists of top blogs, connecting with other thought leaders in the coaching world, prizes and bragging rights (including a badge for your site) if you win. Oh yeah, and it's fun! The contest last year ran from May through June, but we'll be accepting entries earlier this year. Watch this blog for upcoming announcements. I recommend you subscribe by email or RSS. Reading blogs is one of the best free ways to learn about this business. Participating in the blogosphere is a super way to establish yourelf as a thought leader, even if you don't have your own blog. Connecting with bloggers and readers can bring you ideas, opportunities, collaborators and clients. Subscribe to the Coaching Blog above right, to keep informed about this exciting coaching contest. 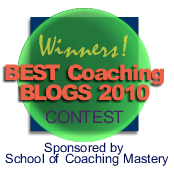 Announcing Best Coaching Blogs 2009 Winners! 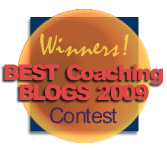 We have our winners for the 2009 Best Coaching Blogs Contest! Forty-five wonderful blogs were entered and I've heard from countless people that it was a terrific introduction to blogs and coaching. Kudos to everyone who entered and participated faithfully. Watch for an announcement about next year's contest in this space. But you want to know who the winners are, right? Here they are. "Wow, thanks so much! This means a lot to me, especially considering the standard of the other blogs - many colleagues whose work I know well (and love reading regularly) were featured in the competition. So this is a real honour. Thanks to everyone!" "Wow-I'm in Hawaii enjoying the surf, flora, and fauna of the big Island. It's hard to imagine winning third place! I feel like Woohoo! I write my blog as inspiration for others who are trying to change their lives. Hopefully,they will be pulled forward into their highest and best life whatever circumstances they are currently in." Sixteen additional bloggers were semi-finalists. All in all, this has been a really fun project. I've been introduced to some amazing coaches and blogs and learned a lot about how to run a contest! Our ultimate goal was to compile a list of Best Coaching Blogs that anyone can visit to learn more about coaching and personal & professional development. Visit all our Best Coaching Blogs Winners here. Over the last 72 hours, I've communicated with virtually every blogger who entered Best Coaching Blogs. And although most of the coaches have used words like, "thrilled" and "delighted" to describe their experience, with many reporting new subscribers to their blogs, there's no question that the voting criteria was misunderstood by some contestants. Some people voted "daily" instead of just once, so the resulting number of votes is simply not a fair yardstick for measurement. Now it's time to decide the finalists. However, I'm simply not willing to do that based on the votes we have. And although I tested some new contest software over the weekend, making the switch to a new, very different contest format after most of the votes have already been cast, won't really be fair, either. So I'm going to let the bloggers, themselves, make the final decisions via closed ballot run off. This option may not please everyone, but it means we can name the Best Coaching Blog of 2009 with pride and confidence. I've learned a lot from this contest and it will be run very differently next year! Thanks to everyone who entered and voted in good faith this year. I hope the introductions to new blogs and the possible awards the bloggers may receive will make this experience overwhelmingly positive! I must say, I feel a bit better about the Best Coaching Blogs snafu. Based on the comments, it seems the rules need to be clearer and the "vote down" option needs to be removed. Plus we need intelligent protocols for checking what's going on. Otherwise, the competition is too tempting for some and too demotivating for others. "Our users are required to verify their accounts (by clicking an activation link sent in an email) before voting. All new votes and entries are kept in a "pending" state until the user clicks the email verification link. When the verification link is clicked, the user is notified that their votes have been made permanent and finally redirected back to the contest site. Once at the site, the user can clearly see that their vote has been recorded. By default our software will allow one voter, per user, per entry for the duration of the contest." So Julia, some voting software will only allow one vote per IP address to prevent more than entry coming form one computer or physical location. We understand that often times several employees of one company or members of one family might wish to vote from the same IP address with different emails, so we've installed filters to alert our staff and the contest creator whenever "suspicious" activity takes place. Wherever multiple votes are cast from a single IP, they are caught in a "filter." Once one of these filters catches a pattern and alerts us to potentially suspect voting, we review each case and evaluate it using a number of other criteria to ensure that all voting is fair, and that no cheating of any kind has taken place. In the event that fraudulent voting has taken place, the contest creator is given the option of dismissing any and all fraudulent votes. It is up to the descretion of the contest creator (you) to decide whether entries should be disqualified, bearing in mind that it is not always the entrant that is responsible for the fake votes, it could just be one bad voter apple in the barrel. Given that helpful explanation, I've set up a "test" or "mock" contest and I invite all Best Coaching Blogs contestents to enter this test contest and votes with impunity. It is live until 2:30 Eastern/NY Time, tomorrow, Sunday, June 21st. There is no winner. The point of this test contest is to get a feel for how the contest software works and how it may be confusing and to try to 'break' the security system. Go ahead and dump your cache, close and reopen your browser, vote from different computers and with different email addresses. I want to see what happens. In other words, break the "rules". Please don't invite your readers, though. This mock contest is just for testing purposes. The layout and look is very different. You will be invited to enter "text". Enter an engaging description of your blog and a link to it. Also enter "tags", title and a short description. You must set up an account to do this. It's easy and fast. Please add comments about the mock contest to this post.